Cracking of concrete over time, is a natural phenomenon. Longer service life of concrete structures is desirable. Self-healing concrete using bacteria, which could form CaCO3 crystals for crack sealing, has promised benefits to reduce cost for concrete maintenance, because cracks could be autonomously repaired without human intervention. However, because of harsh concrete internal environment render the effectiveness depending on the bacteria viability within concrete. 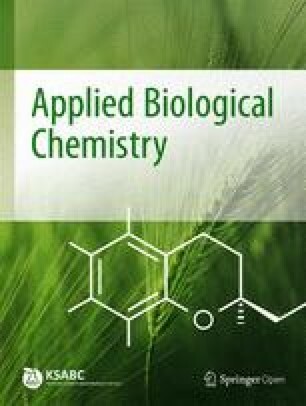 In this study, expanded clay (EC) was used as a carrier, to protect bacteria (Lysinibacillus boronitolerans YS11) from the harsh environment during the process. Existence of bacteria inside EC was observed using electron microscopy. When exposed to bacterial solution of 1.0 × 109 cells/mL, bacterial density within EC reached approximately 0.82 × 107 cells/g of dry EC. Extent of bacterial viability within EC, submerged to solution containing 1.0 × 108 cells/mL, was 53.6% of free bacteria solution containing 1.0 × 107 cells/mL, as measured with fluorescein diacetate assay. When rate of calcium carbonate formation was measured with Ca2+ disappearance, rates were comparable between bacteria within EC (submerged to bacterial solution containing 1.0 × 108 cells/mL) and free bacteria (1.0 × 107 cells/mL). This finding indicates that bacteria with EC is very active for generation of CaCO3 within EC. All experimental results suggest that EC may be an adequate bacteria carrier for self-healing concrete. Concrete is a construction material that cannot be replaced, with other modern technologies yet. Thus, concrete is irreplaceable construction material in terms of availability, versatility, and economy. However, concrete is not permanent material. Cracks in concrete shorten the life of concrete [1, 2]. Accordingly, the importance and necessity of self-healing concrete has been emphasized [3, 4]. In bacterial-based self-healing concrete, calcium carbonate (CaCO3) produced by bacteria heals the crack [5, 6, 7]. Because of high pH inside concrete, shear forces by mixing, and shrinkage during concrete drying, bacterial viability is very limited for appropriate healing ability of self-healing concrete. To solve such problems, various carriers have been studied to protect bacteria [8, 9, 10]. Different types of carriers, such as melamine-based microcapsules, diatomaceous earth, polyurethane foam, silica gel, and polyurethane (PU), hydrogel have been proposed to protect bacterial cells. However, the majority of these carriers had negative impact on concrete mechanical properties . Thus, it is needed to search for other kinds of carriers. In this study, expanded clay was tested as a carrier of bacteria Lysinibacillus boronitolerans YS11, which has carbonatogenesis activity of microbially induced calcium carbonate precipitation (MICP) . The purpose of this study was to observe potential usability of expanded clay as a bacterial carrier for self-healing concrete. Lysinibacillus boronitolerans YS11 was isolated from rhizosphere soil of Miscanthus sacchariflorus using biomineralization-inducing B4 medium, which is often used for screening of possible calcium carbonate precipitating bacteria . Lysinibacillus boronitolerans YS11 was cultivated in Lunia-Bertani (LB) broth at 37 °C for 20 h. Growth media was replaced with phosphate buffered saline (PBS, pH 7.5) . Expanded clays (diameter 2–5 mm; Liapor, Germany) were autoclaved at 121 °C for 20 min. Then, the expanded clay (EC) was immersed in PBS containing bacteria under a vacuum chamber (Cast N’ Vac 1000, Buehler, Germany), until bubble generation stops. As necessary, the surface of EC was gently sprayed with 80% ethanol, and exposed to ultraviolet light for 10 min with mixing to remove bacteria on the surface. Then, the EC was collected to be dried in an oven at 70 °C for 2 days. Bacteria-immobilized EC was gently hammered to obtain pieces of EC. Then, broken pieces were fixed first with Karnovsky’s solution (2% paraformaldehyde, 0.1 M phosphate buffer, and 2.5% glutaraldehyde, pH of 7.2) for 2 h and then, with 2% osmium tetroxide solution for 2 h. Fixed samples were gradually dehydrated with ethanol (30, 50, 70, 100%) for 10 min at each gradient, and placed onto an aluminum stub for 4 days to be dried in clean bench . Prepared samples were observed with scanning electron microscope (JSM-7401F, FE-SEM, JEOL, USA) to find bacteria within EC. For a performance test, EC was immersed in PBS solution containing bacteria (1.0 × 106, 1.0 × 107, 1.0 × 108 cells/mL) after surface-sterilization, and dried as described above. The 3 bacteria-immobilized carrier was shattered, using a hammer mill. Each 1 g of the broken pieces received 9 mL of PBS solution to be shaken gently a few times. Then, each of the PBS solution was serially diluted, to be spread onto LB agar to count the colony forming unit (CFU) [13, 14], by which immobilizing capacity (CFU/g of dry EC) of expanded clay was calculated. Fluorescein diacetate assay (FDA) was also performed to measure viability of immobilized bacteria . One gram of shattered EC above received 15 mL of potassium phosphate buffer (60 mM, pH 7.6) and 0.2 mL FDA stock solution (1 mg/mL) to be shaken gently by hand, and placed on an orbital incubator at 30 °C for 20 min. Then, 15 mL of chloroform/methanol (2:1 v/v) was added, to the solution of EC for reaction termination. The solution of EC was centrifuged at 900×g for 3 min. The supernatant was filtered using Whatman No. 2 into conical flasks, and absorbance of filtrates was measured at 490 nm with spectrophotometer (EL-800, DI Biotech, Korea). It is known that colorless fluorescein diacetate is hydrolyzed by free and membrane bound enzymes, to release a colored end product of fluorescein, which can be measured by spectrophotometry [15, 16]. To confirm bacteria ability of microbially induced calcium carbonate precipitation (MICP), the level of calcium ion consumption was measured, using calcium-ion selective electrode (ISE) (Thermo Fisher Scientific, USA). Control medium (30 mL) contained calcium ion source (0.25% calcium lactate) and nutrient for bacteria (0.4% yeast extract). 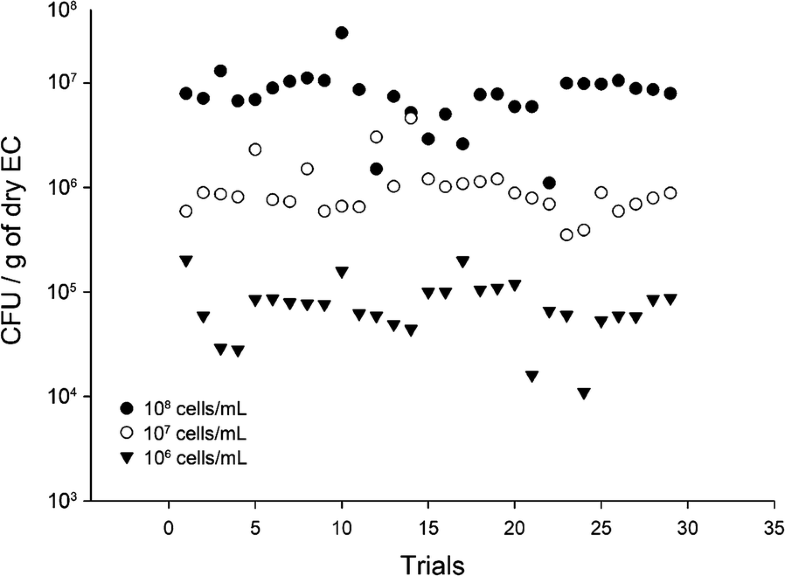 Extent of calcium ion consumption was measured for control medium, EC only, bacteria (1.0 × 106 cells/mL) only, and EC-immobilized bacteria (1.0 × 106 cells/g of dry EC). 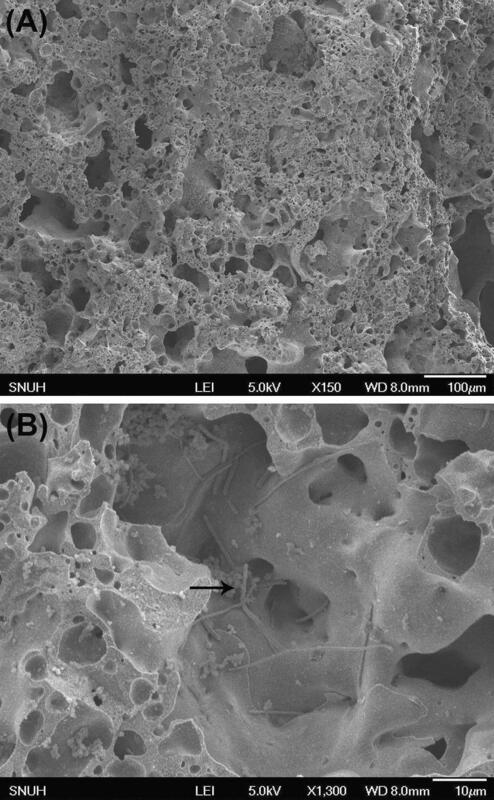 Extents of calcium consumption were measured for 24 h.
In this study, expanded clay (EC) was proposed as a carrier of bacteria for cabonatogenesis in concrete. That is, EC as a carrier could protect bacteria from harsh concrete environment, so that more calcium carbonate precipitation is induced within concrete crack than without a carrier. For EC to be a carrier, it must show that bacteria YS11 strain can enter or be immobilized into channels within EC, at which bacteria can be protected from a harsh environment of mechanical stress, high pH, and temperature. Figure 1A shows an SEM image of the inner part of porous EC, at which copious empty channels and space were observed. That is, space or channels ranging from approximately 10–100 µm micrometers were observed inside EC. As bacteria YS11 entered into EC inner part, a number of bacteria was observed to be attached on the inner surface of EC (Fig. 1B). To know how many bacteria could enter into EC, bacteria-immobilizing or holding capacity (CFU/g of dry EC) of EC needed to be measured. About 10 pieces of EC were submerged into PBS solution containing 1.0 × 106, 1.0 × 107, and 1.0 × 108 bacteria cells/mL. Then, the bacteria-immobilized EC was surface-sterilized, and dried as described in “Materials and methods” section. The three different kinds of immobilized ECs were shattered into small pieces. Each 1.0 g of the broken pieces was used to measure colony forming unit (CFU). Immobilizing capacity (CFU/g of dry EC) of expanded clay was approximately 0.80 × 105, 1.08 × 106 and 0.82 × 107 CFU/g of dry EC with 1.0 × 107, 1.0 × 108, and 1.0 × 109 bacteria cells/mL, respectively (Fig. 2). This means that approximately 1% bacteria cells in each mL of bacterial solution were immobilized into 1 g of dry EC. Expanded clay has a disadvantage as a bacteria carrier, since it has physically very limited space for bacteria immobilization. However, unlike other carriers, strength to withstand the internal environment (i.e., heat and pressure) of concrete is one of the most important advantages as a bacteria carrier of self-healing concrete . To examine viability extent of immobilized bacteria, FDA assay was performed (Fig. 3). Immobilized bacteria, made by submerging EC into free bacteria solution containing 1.0 × 108 cells/mL, had approximately 53.6% activity of control solution, containing free bacteria of 1.0 × 107 cells/mL. Viability extent of immobilized bacteria, was slightly higher (11.6%) than that of free bacteria containing 1.0 × 106 cells/mL. Results showed that immobilized bacteria are alive, and also have enzymatic activity so that it may have cabonatogenesis ability; that is, self-healing ability for concrete crack . Because EC was submerged into 1.0 × 108 cells/mL, bacteria-immobilized EC was expected to have approximately 1.0 × 106 CFU/g of dry EC and its corresponding viability. As expected, EC-immobilized bacteria, had almost the same degree of viability with free bacteria containing 1.0 × 106 cells/mL. This may be due to the fact that bacteria-immobilized EC, were broken into small pieces for the experiment. Thus, it may be exposed outside EC, more directly than EC without breaking. 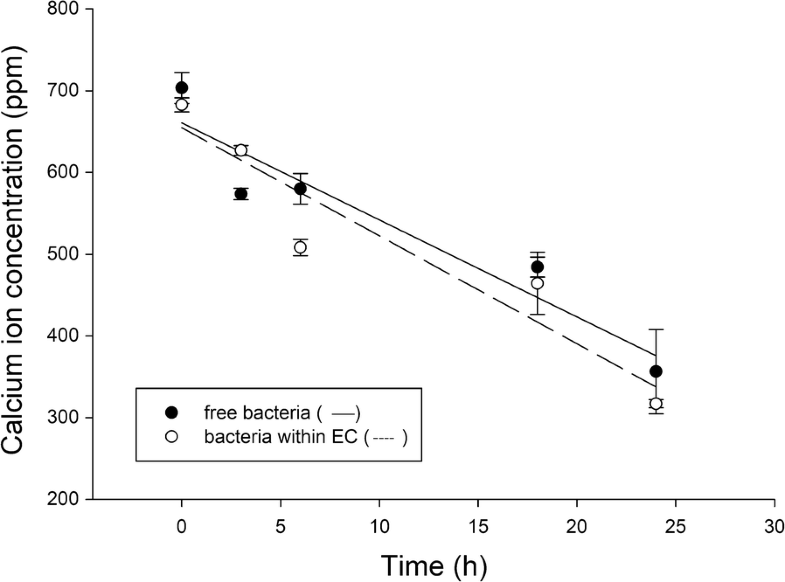 To confirm biomineralization or carbonatogenesis activity by the EC-immobilized bacteria, extent of calcium ion consumption was measured for 24 h using calcium-ion selective electrode (ISE), since there is no direct method to measure extent of calcium carbonate formation within EC [18, 19] As shown in Fig. 4, decreases in calcium ion concentration were observed, with free bacteria (1.0 × 106 cells/mL) and EC-immobilized bacteria (1.0 × 106 cells/g of dry EC). Decreasing extent of calcium ion with time were very similar at approximately 14.8 ppm/h, for free and immobilized bacteria without statistical difference. This result suggests that while control medium and EC only had no carbonatogenesis activity, EC-immobilized bacteria was active for calcium carbonate formation as much as free bacteria. In this study, expended clay (EC) was tested as a carrier of bacteria, which have self-healing ability for concrete crack. Prevention or crack-healing is necessary, for cost reduction during building construction. Cracks in concrete materials form gradually with time so that inclusion of bacteria for crack self-healing capability, may be needed at the time of building construction . However, direction inclusion of bacteria in concrete is problematic, due to heat during curing and pressure by concrete. In addition, there is no food for bacterial in concrete. Thus, use of the bacterial carrier is necessary, for proper crack curing of concrete. There could be many carriers for this purpose [21, 22] as well as for agricultural purpose . Here, we confirmed that expended clay may be an adequate bacterial carrier, for crack self-healing of concrete. First, a part of bacteria easily entered into EC, by submerging as confirmed by SEM observation and CFU test (Figs. 1, 2). Second, bacteria L. boronitolerans YS11 was viable after immobilization within EC, as tested with FDA (Fig. 3). Third, bacteria YS11 formed calcium carbonate as suggested, by consumption of calcium ion. All results suggest that EC could be used as a carrier of bacteria, for self-healing of concrete. However, it is necessary to perform more tests for other kinds of EC in the future, since there are many other ECs in the market made by various companies . SH analyzed the data and wrote the paper. EC provided microscope technical assistance to SH and helped with the data collection. WP provided advice of experimental design. CY helped the preparation of experiments. NC revised and edited the manuscript and supervised the work. All authors read and approved the final manuscript. This study was supported by a Grant (17SCIP-B103706-03) from the Construction Technology Research Program funded by the Ministry of Land, Infrastructure and Transport of the Korean government.